Huffington Post founder Arianna Huffington advocates a need for a new definition of success and talks about how she has co-parented her children after divorce. 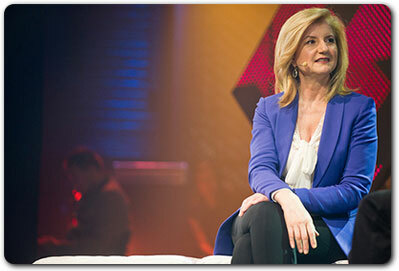 Huffington Post founder Arianna Huffington knows all about success defined in conventional terms however she now views the need for a new metric to measure success. After collapsing from exhaustion in 2007, and spending time trying to get to the bottom of what caused it, she realised that something needed to change radically in her life. Many readers struggling to juggle work, careers, and family life will have firsthand experience of the “stress, sleep deprivation, and burnout” Arianna refers to as the norm within the western workplace culture. This style of collaborative parenting on divorce is something that we encourage most couples to consider. Our Collaborative Divorce service enables couples to transition divorce in a respectful way and to co-parent effectively into the future. It helps parents to focus on the well-being of the children involved and helps parents to understand that they need to be the adults in the process and make it as painless as possible for their children. It’s often difficult for adults who are themselves hurting or experiencing extremes of emotion, to remember that their children love them both and are often bewildered by what is going on. The children don’t want to hear harsh words about someone they love or be used as a weapon to punish the other parent. Our Collaborative divorce service encourages parents to focus on how to achieve the best outcome for the family as a whole, with the children’s well-being firmly put at the centre of all decision making.